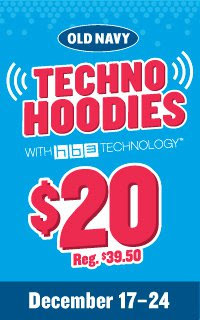 Old Navy has a special price on Techno Hoodies from December 17-24, 2010, regularly $39.50 now only $20. If you are wondering with Techno Hoodies are (I know I am) they are hoodies that you can listen to music in while wearing. Sounds like they would make for an interesting present for someone. -Just plug in your music and move! These are also available through HoodieBuddie, who has the same technology on their hoodies. They have cool designs, too.